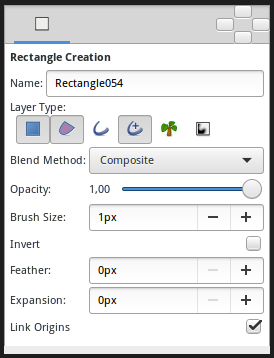 Name : Used for the new layer name; any number in this field will automatically increment with each layer created. Blend Method : How to combine the new layer with the background. Expansion : Expand the rectangle from his corners (only for Rectangle Layer. Is related to his Expansion Amount Parameter). Feather : Width of the area to be dissolved at the edge (not for Rectangle Layer, Plant and Curve Gradient).